Two bedroom house. Master bedroom includes ensuite with spa bath. Bedroom two has two single beds. Seperate lounge/dining areas. Ideal for families. 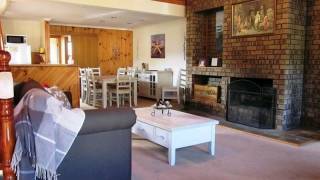 Situated adjacent to the main accommodation, the villa is a private retreat for those who really like to relax, positioned with a view out to Batemans Bay's beautiful Clyde River this is the ultimate in Batemans Bay accommodation. Deluxe Double A spacious room with a Queen bed and a sofa that can fold out to another bed if needed, these rooms come with flat screen TV with Austar access and Coffee and Tea making facilities and a fridge. They also boast a large open bathroom; these rooms will make you feel right at home. Delux Twin a large room with plenty of space to move. Supporting a Queen and single bed plus a flat screen TV with Austar, it has Coffee and Tea making facilities. Featuring an open bathroom and air conditioning these rooms will have you relaxed in no time at all. Two Bedroom Suite on the second level of the motel overlooks Batemans Bay's beautiful Clyde river, the room has a spacious main living area with kitchenette, fridge and microwave, there is a flat screen TV with Austar and lounge and a dining table. The bathroom is modern and open, leading on to the main bedroom with a queen bed and plenty of room including wardrobe and desk. The second bedroom has two single beds and a wardrobe with a suitable amount of room for the kids or extra guests. Situated on the picturesque south coast town of Batemans Bay NSW, the Argyle Terrace Motor Inn is Batemans Bay's leader in quality waterfront holiday accommodation; with the Clyde River only 100 meters away from the front door you can almost cast a line in from your room. 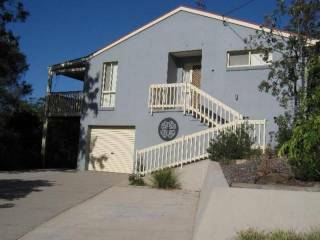 Argyle Terrace Motor Inn is the perfect place to stay when holidaying on the beautiful South Coast of New South Wales. Contact us today if you for amazing holiday packages and accommodation in the Batemans Bay area. 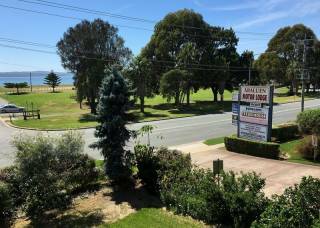 "Argyle Terrace is the perfect place to stay on your holiday to the South Coast..."
Located just five minutes' walk from Batemans Bay's CBD, the Argyle Terrace Motor Inn is the perfect place for you to get away for a week, or a weekend. With the 27-hole championship golf course only 5mins down the road, tennis courts and squash courts, plenty of shopping, beaches, and other tourist attractions, Batemans Bay is a great place to get away from a busy life and relax doing whatever you like best. 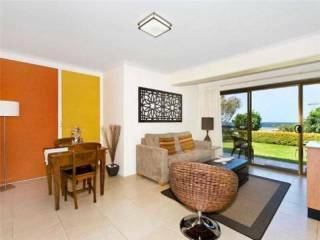 With 12 rooms, and your choice of a twin bedroom suite or a deluxe room and a self contained two bedroom villa you will find Batemans Bay accommodation to suit your needs. The main bedroom has an ensuite complete with a "neck massage, therapeutic spa" to pamper you. The villa has 2 bedrooms; the main room is spacious with a Queen bed, ensuite spa and a TV. The second bedroom has two single beds that can be joined together to make a king size bed. There are two sofa lounges in the living room that convert to additional beds if needed. Both bedrooms have large wardrobes. The kitchen is fully equipped with a fridge, stove, oven and microwave as well as necessary utensils, including a 6 seat dining table. The lounge room off the kitchen has two sofas with large Flat screen TV with DVD player and Austar. The villa is right next door to the accommodations pool with your own entrance. At the back of the Villa there is an outside dining area with gas Barbecue and outdoor seating. There is also an external cloths line with your own washing machine and access to a dryer where needed. Why not take a picturesque walk into Batemans Bay and have breakfast on one of the many water front cafés. For dinner you could cook your freshly caught fish or go to one of Batemans Bay's restaurants like: the Soldiers Club, Catalina Country Club or Rafters Thai restaurant. Terms & Conditions Bookings cancelled within 24 hours of the arrival date will incur a loss of the first night's accommodation charge..